There's an adage that describes the efficiency of taking care of more than one issue at a time: it's called "killing two birds with one stone," and it's an image that's admittedly a bit macabre when you get right down to it. 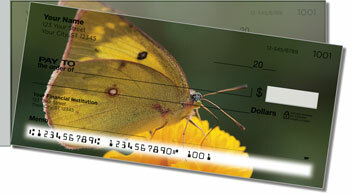 Still, the phrase is completely appropriate when you think about the process by which butterflies pollinate plants. As the flitting insects feast on the nectar of their favorite flowers, they pick up pollen on their wings which they then carry to other flowers. That, in turn, in turn creates still more blooms! 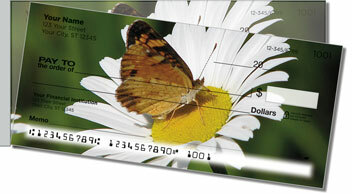 So you see, butterflies are a lot like you, which means they're really good at multitasking! 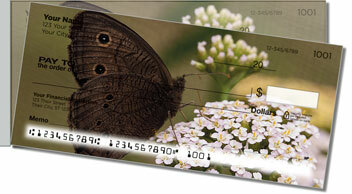 Now you can do a little double duty of your own by choosing Butterfly Garden Side Tear Checks. They'll let you take care of your financial obligations while sharing these uplifting nature photographs at the same time! 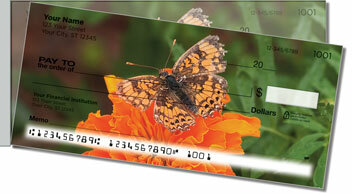 Don't delay -- personalize your own set of Butterfly Garden checks today!